Michel Amlingue, Clarinet in A and B-flat, about 1794. Ebony, ivory, brass. Gift of Mrs. Henry B. Chapin. The MFA’s Musical Instruments Collection contains over 1,100 examples from around the world, ranging from ancient times to the twenty-first century. 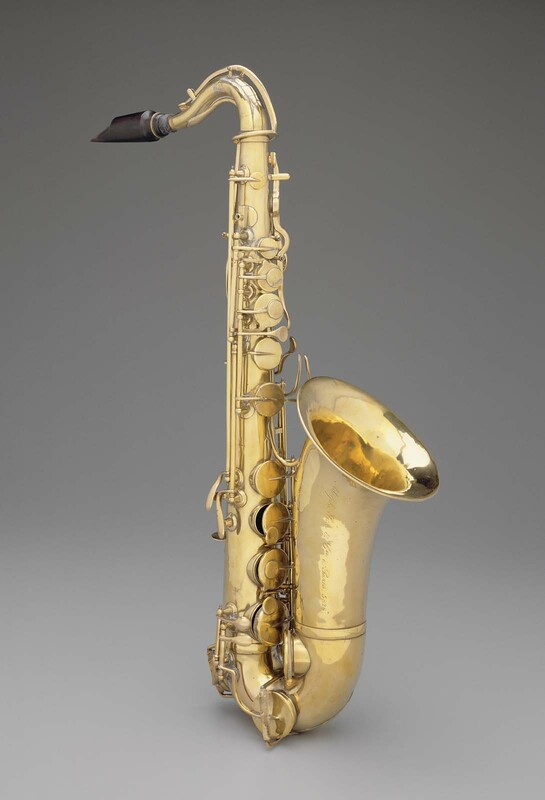 Explore a selection of clarinets, saxophones and related instruments from the Museum’s holdings. Boxwood body in four parts: barrel, upper and lower body, and bell. No ferrules. Mouthpiece of ebony. Seven fingerholes and one thumbhole. Six square keys (Young type F) of brass (e, f-sharp, g-sharp, a’, a-shake’, and speaker), mounted on rings and blocks with springs attached to keys. Pitched in B-flat. Stamped on all joints: AMLINGUE / A PARIS / B; stamped on alternate barrel, and upper and middle bodyjoints: AMLINGUE / A PARIS / A; stamped on mouthpiece: [six-point star] / DUBOST / [six-point star]; engraved on brass plate on case: Bryant P. Tilden. In A. Boxwood, stained light yellow-brown. Ivory rings. Blackwood mouthpiece. Made in six parts: mouthpiece, barrel, upper, lower, and middle bodyjoints, and bell. Seven fingerholes and one thumbhole. Five square keys (Young type A) of brass (e, f-sharp, g-sharp, a’, and speaker), mounted on rings with SATK. Blackwood mouthpiece cover (not original). In C. Boxwood, varnished light yellow-brown. Ivory rings. Blackwood mouthpiece with boxwood cover. Made in six parts: mouthpiece, barrel, upper, middle, and lower bodyjoints, and bell. Seven fingerholes and one thumbhole. Six square keys (Young type A) of brass (e, f-sharp, g-sharp, a’, a-shake’, and speaker), mounted on rings and blocks with SATK. Mahogany-veneered case with black cloth lining (held in place by brass tacks), three used reeds, and three strips of manuscript music. In C. Boxwood, varnished light yellow-brown. Ivory rings. Blackwood mouthpiece with boxwood cover. Made in six parts: mouthpiece, barrel, upper, middle and lower bodyjoints, and bell. Seven fingerholes and one thumbhole. Five square keys (Young type A) of brass (e, f-sharp, g-sharp, a’, and speaker), mounted on rings with SATK. Stamped on all joints except upper body: H. HOSFORD, / ALBANY. In C. Boxwood, varnished medium brown. Horn rings. Cocuswood (?) mouthpiece (later). Seven fingerholes and one thumbhole. Five square keys (Young type A) of brass (e, f-sharp, g-sharp, a’, and speaker), mounted on blocks with SATK. In C. Boxwood varnished light brown. Ivory rings. Blackwood mouthpiece (later) with boxwood cover. Made in six parts: mouthpiece, barrel, upper, middle, and lower bodyjoints, and bell. Seven fingerholes and one thumbhole. Six round keys (Young type S) of brass (e, f-sharp, g-sharp, c-sharp’, a’, and speaker), mounted on blocks with SATK. In B-flat. Boxwood, varnished light yellow-brown. Ivory rings. Blackwood mouthpiece. Made in six parts: mouthpiece, barrel, upper, middle, and lower bodyjoints, and bell. Seven fingerholes and one thumbhole. Five square keys (Young type A) of brass (e, f-sharp, g-sharp, a’, and speaker), mounted on rings with SATK. In B-flat. Boxwood, varnished light yellow-brown. Ivory rings. Blackwood mouthpiece (later). Made in six parts: mouthpiece, barrel, upper, middle, and lower bodyjoints, and bell. Seven fingerholes and one thumbhole. Eight round keys (Young type S) of brass (e, f-sharp, g-sharp, c-sharp’, g-sharp’, a’, a- shake’, and speaker), mounted on blocks with SATK. Old (original?) wood case. In C. Boxwood, varnished dark brown. Ivory rings. Cocuswood mouthpiece. Made in six parts: mouthpiece, barrel, upper, middle, and lower bodyjoints, and bell. Seven fingerholes and one thumbhole. Six round keys (Young type S) of brass (e, f-sharp, g-sharp, a’, a-shake’, and speaker), mounted on blocks with SATK. Used reed and old string for tying on. Stamped on upper bodyjoint and bell: [eagle] / GRAVES & C / WINCHESTER / N. H. / C; stamped on barrel, and middle and lower bodyjoints: GRAVES & C / WINCHESTER / N. H.
In C. Boxwood, varnished light yellow-brown. Ivory rings. Cocuswood mouthpiece (later). Made in six parts: mouthpiece, barrel, upper, middle, and lower bodyjoints, and bell. Seven fingerholes and one thumbhole. Twelve domed keys of brass (e, f-sharp, g-sharp, b-flat, b, c-sharp’, e-flat’, f’, g- sharp’, a’, a-shake’, and speaker), mounted on blocks with SATK. In B-flat. Varnished rosewood. Nickel-silver rings. Rosewood mouthpiece and cap. Made in five parts: mouthpiece, barrel, upper and lower bodyjoints, and bell. Six fingerholes and one thumbhole. Thirteen cupped keys of nickel silver (e, f, f-sharp, g-sharp, b-flat, b, c’-sharp, e’-flat, f’, g-sharp’, a’, a-shake’, and speaker, mounted on posts. In B-flat (high-pitch). Varnished blackwood. Nickel silver rings, keys, ligature, and mouthpiece cover. Blackwood mouthpiece. Made in five parts: mouthpiece, barrel, upper and lower bodyjoint, and bell. Six fingerholes and one thumbhole. Albert system. Leather storage bag. Stamped on barrel, lower bodyjoint, and bell: [lyre] / BUFFET / Crampon & Cie / A PARIS / [maker's monogram]; stamped on back of lower bodyjoint: 6680; stamped on upper bodyjoint: [lyre] / BUFFET / Crampon & Cie / A PARIS / [maker's monogram] / BREVETES / S.G.D.G. In B-flat. Varnished blackwood. Nickel silver rings, keys, ligature, and mouthpiece cover. Plastic mouthpiece. Made in five parts: mouthpiece, barrel upper and lower bodyjoints, and bell. Original 1920s body modified about 1955 to full-Boehm system keywork and rimless bell (Mazzeo system). Extra barrel and hardshell fitted case. In A. Varnished blackwood. Nickel silver rings and keys. Mouthpiece missing. Made in five parts: mouthpiece, barrel, upper and lower bodyjoints, and bell. Original 1920s body modified about 1955 to full Boehm-system keywork and rimless bell (Mazzeo system). Extra barrel and hardshell fitted case. Body of boxwood in five parts: barrel, upper, middle, and lower body, and bell. Ferrules of ivory. Mouthpiece of ebony. Six fingerholes and one thumbhole. Five square keys (Young type F) of brass (e, f-sharp, g-sharp, a’, a-shake’, and speaker), mounted on blocks with springs attached to keys. Pitched in E-flat. In E-flat. Boxwood, varnished light orange-brown. Horn rings. Blackwood mouthpiece. Made in five parts: mouthpiece, barrel, upper and lower bodyjoints, and bell. Seven fingerholes and one thumbhole. Eight round keys (Young type S) of brass (e, f-sharp, g-sharp, c-sharp’, g-sharp’, a’, a- shake’, and speaker), mounted on blocks with SATK. Used reed tied on with old string. In F. Boxwood, stained light yellow-brown. Horn rings. Brass bell. Cocuswood mouthpiece (later). Made in seven parts: mouthpiece, barrel (bent backward), upper bodyjoint, knee (120-degree bend), lower bodyjoint, kasten, and bell. Six fingerholes and one thumbhole. Seven square keys (Young type C) of brass (c, e, f-sharp, f, g-sharp, a’, and speaker), mounted on rings with SATK. In F. Boxwood, varnished dark brown. Ivory rings and mouthpiece (later). Brass bell. Made in eight parts: mouthpiece, barrel, upper bodyjoint, knee (120-degree bend), middle and lower bodyjoints, kasten, and bell. Six fingerholes (the third doubled) and one thumbhole. Eight original square keys Young tyep A) of brass (c, d, e, f, f-sharp, g-sharp, a’ and speaker), mounted on rings brass saddles with SATK. Six later keys (b-flat, b, c-sharp’, e- flat’, f’, and g-sharp’), mounted on brass saddles with SATK. In E-flat. Boxwood, varnished dark brown. Ivory rings. Horn knee. Brass bell. Cocuswood mouthpiece (later). Made in seven parts: mouthpiece, barrel (later), upper bodyjoint, knee (120-degree bend), lower bodyjoint, kasten, and bell. Six fingerholes and one thumbhole. Sixteen square keys (Young type C) of brass (c, c-sharp, d, e-flat, f, f-sharp, g-sharp, b-flat, b, c-sharp’, e- flat’, f’, g-sharp, a’, and speaker), mounted on rings, blocks, and brass saddles. At least five keys (b-flat, b, c-sharp’, e-flat’, and f’), mounted on brass saddles, appear to be later. In C. Pearwood, varnished dark brown. Horn rings. Rosewood mouthpiece (later). Made in five parts: mouthpiece, crook, barrel, body, and bell. The body is carved from two separate slabs to make possible the forming of the bore of serpentine shape; the halves are glued together and fastened by iron pins. Nine fingerholes in the front (the second and eighth doubled; the first and fifth stopped by the middle joints of the fingers) two thumbholes, and one venthole in bell. Five square keys (Young type A) of brass (e, f#, g#, a’, and speaker), mounted on blocks with springs attached to keys. In F. Boxwood, varnished dark brown. Ivory rings and mouthpiece. Made in six parts: mouthpiece, curved brass crook, upper, middle, and lower bodyjoints, and bell. Six fingerholes and one thumb hole. Ten original square keys (Young type A) of brass (e, f, f-sharp, g-sharp, b, c-sharp’, e- flat’, a’, a-shake’, and speaker), mounted on blocks with SATK. Three later keys (b-flat’, f’, and g-sharp’), mounted on brass saddles with SATK. In B-flat. Boxwood, varnished dark brown. Nickel silver rings, gooseneck crook, and bell. Made in five parts: mouthpiece, crook, upper bodyjoint, buttjoint, and bell (turned upward and outward). Seven fingerholes (the third and fourth stopped by open-standing keys) and one thumbhole. Twenty cupped keys of nickel silver (c, c-sharp, d, e-flat, e„ f, f-sharp, g-sharp, b-flat b X 2, c’, c-sharp’, e-flat’, f’ x 2, g-sharp’, a’, a-shake’, and speaker), mounted on posts and hinge tubes. Alto in E-flat. Conoidal tube of brass with downward bent mouth-pipe and upturned bell; detachable mouthpiece. Eighteen tone-holes of various diameters covered by keys with chamois pads. Two independent octave keys. Walnut, stained brown. Made in two parts: mouthpiece and body. Eight fingerholes (one stopped with wax) and one thumbhole. In C. Maple stained dark brown. Made in three parts: long mouthpiece, bodyjoint, and bell. Seven fingerholes (the lowest doubled) and one thumbhole. Two square keys (Young type A) of brass (a’ and b’), mounted on rings with SATK. Mouthpiece cover. 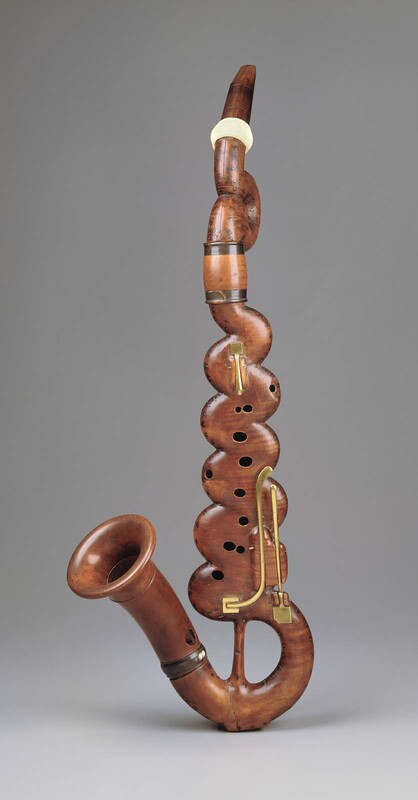 The original of this instrument is in the Bavarian National Museum, in Munich. In C. Oiled walnut. Made in three parts: long mouthpiece, bodyjoint, and bell. Seven fingerholes (the lowest on bell) and one thumbhole. Two square keys (Young type A) of brass (a’ and b-flat’), mounted on rings with SATW. 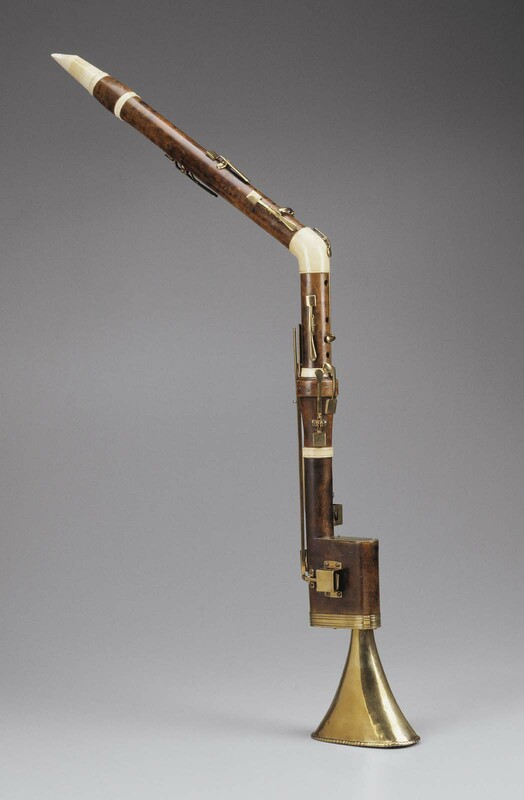 The original of this instrument is in the Museé Instrumental in Brussels, no. 912 in the catalog by Mahillion.